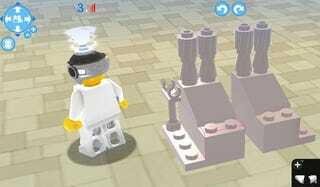 LEGO Universe MMO Log Two: Excitement Builds? Having exhausted a majority of the questing content during my first week playing LEGO Universe, I dedicated my second week to that most basic of LEGO activities: Building. Kotaku's MMO reviews are a multi-part process. Rather than deliver day one reviews based on beta gameplay, we play the game for four weeks before issuing our final verdict. Once a week we deliver a log detailing when and how we played the game. We believe this gives readers a frame of reference for the final review. Since MMO titles support many different types of play, readers can compare our experiences to theirs to determine what the review means to them. Last week I was on vacation, so I had plenty of time to tool around in LEGO Universe, completing quests, fighting pirates, and advancing my chosen profession. Time was of the essence this week, so this week's log will be a bit short, but packed with LEGO building goodness. It's going to be a busy week for me work-wise, but I plan on squeezing as much LEGO Universe time as I can out of the next six days, as long as the next step in my journey proves fulfilling enough. Throughout my adventures I've been picking up random LEGO bricks. Some have come in large LEGO brick packs given as quest rewards. Others have dropped randomly off of defeated monsters. I'm glad NetDevil gave me a dedicated brick slot in my backpack, because this is one confusing inventory. I take a rocket ship to one of my properties, toss on my thinking cap, and begin to build . . . something. I want to create some sort of robot, I think, but without a cohesive plan, the going is slow. I place some bricks for feet. I decide to extend the feet, selecting the bricks I've stacked so far and clicking them down on top of platforms. I imagine some sort of tube running up the leg, but I'm having issues navigating my inventory looking for the right pieces. It's a pretty daunting task. An hour and a half into building, and I'm pretty much still stuck with a pair of robot feet. Maybe I'm just too tired to do this tonight. I'm just getting frustrated. I'll come up with a plan tomorrow. I need inspiration, and this is a game that's supposedly filled with creative people, so what better way to figure out what to build than to look at what those people are doing? From the rocket pad on my property I can access a ranked list of other public properties I can explore. I decide to browse a few. First up, a LEGO Space Station. I like what this guy is doing. He's got an R2 unit under glass, a space shuttle sort of thing. There are spacemen. there's a sports car, and a shark. Okay, maybe it's not the most coherent of visions, but it's a vision. Next up, a haunted LEGO mansion. Now this is more like it. Not only has this creator crafted a rather massive building, he's also got spawning monsters that drop real loot. If I could just create a monster generator like he's using I could spawn an endless amount of enemies , generating an endless amount of coins, bricks, and power-ups. An idea is forming, but I still want to see more. It bears noting that each journey between player-made properties takes at least two minutes to load, based on the complexity of the build. This explains why we can't bring our creations into the main game world; it would explode. My final property inspection takes me to a LEGO hedge maze. I like the use of scripted behaviors to make the assorted creatures talk to you when you pass within range. This is a nice and simple build that shows that you don't need to spend ages to create something special. An idea coalesces in my mind. These creations have sparked my own creative vision. I am going to create LEGO Kotaku Tower. I log in this evening and the first thing I do is destroy everything I've created so far. I'm finicky like that. I decide to try and do this right, planning out the structure, figuring out which bricks I need in advance, and then implementing. I begin by laying out a flat plain of LEGO planks to build on. Then I take a trip to my local brick merchant. Bricks are the building blocks of LEGO Universe, so they are relatively cheap. I have 25,000 coins, and everything I need is ten coins apiece. I buy a metric ton of LEGO pieces and head back. Some slanted-face bricks will serve as the foundation for Kotaku Tower, so I begin placing pieces along the edges of my base. The build interface's cloning tool comes in hand here. I lay down a brick, clone it, select those two, clone them, and so on. Bricks are removed from my inventory as I do this. Soon I've run out of slanted pieces. This is going to be more work than I thought. Will I ever have time to finish this tower? I log in for a brief moment, stare at what I've created so far and sigh. Logging into my property and its unfinished tower is just too depressing. Instead, I spend a couple of hours wandering around places I've already been. I kill some pirates, some robots, and some spiders, unlock a few more achievements, and log out. It's still fun, just running about, but the specter of the unfinished tower looms. I need a building planner. I need some sort of program that allows me to quickly generate a design in LEGO bricks and then gives me step-by-step instructions on how to create it. I wish I could invite other players onto my property to help me build. Perhaps I'll take a little breather next week. Maybe start another character and try some of the other career paths. Anything but sit and stare at that tower again.